I was reading this book the other day and the main girl in the book says to the guy “Have you ever done something really really stupid?” He responds “No” and after a short pause “but I’ve done something really really really stupid.” Last night, I did something in the really really really stupid category. I was ready to upload my pictures from my camera to my laptop from my lovely strawberry jalapeño salsa photoshoot and feeling excited. Because this salsa was the bee’s knees (still bringing bee’s knees back, don’t care what you all say!). I inserted my SD card into the slot on my computer and just stared at it because it didn’t seem right. Normally I have to get the SD card in there just right, but I wasn’t entirely looking, since I was multitasking to the extreme. I took another glance and realized I put my SD card right into the CD drive. After a moment of panic, because sadly I was more worried about the pictures than my laptop at that moment (priorities right), I sat down and did what any person in this day and age would do.. Google to the rescue. All I searched was “something stuck in CD drive” and the first link to pop up was “SD card stuck in MacBook CD drive.” After a few minutes of prodding at the laptop, Michael was able to fish out the SD card, crisis was averted, and strawberry jalapeño salsa on the blog. A little bit about this delicious salsa – well in short, it’s amazing. It’s perfectly sweet and spicy all at the same time. The lime juice gives it that perfect hit of acidity, giving it that fresh and flavorful taste that everyone so craves during the summer. It works well as a summertime chips and salsa appetizer, on some pulled pork tacos, or even spooned over some fish for a healthy dinner. Versatile might just be it’s middle name. I would just like to say to all of those 40 people who commented on the “SD card stuck in MacBook CD drive” link, this strawberry jalapeño salsa is for you. This post would not be possible with all of your comments as I would still have a stuck SD card and an anxiety driven melt down. And I would have felt a whole lot stupider without knowing that I am not the only one to have made that silly mistake. So again, this one’s for you. 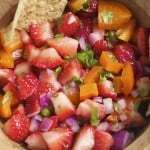 This strawberry jalapeño salsa makes a great appetizer when served with tortilla chips and also tastes delicious when served with meat or fish. Gluten-free, dairy-free and vegan. In a bowl, mix together ingredients until combined. This salsa looks fantastic, and I love all the bright, cheery colors!! I’ll definitely have to try this sometime soon! Sticking the SD card in the CD drive doesn’t seem too bad – I can see how it could happen, especially if you’re kind of distracted. My recent “really really really stupid” moment was when my boyfriend and I locked both sets of keys in the car, WITH the dog inside, at the drop-off zone at the airport. Ugh. I’m a big fan of bright colors in my recipes 🙂 it just makes me want to eat it so much more ya know? Thank you for sharing your “really really really stupid” moment with me! That makes me feel better that I’m not the only one to do silly things! Thank you Anna! It’s one of my favorite summertime recipes! This looks summer-fresh and healthy! If only I could find fresh Jalapeno’s here in NL! Thanks for the inspiration!!! Thanks Jocelyn! So fun to chat with readers across the world – this is why I love blogging 🙂 whenever I don’t have jalapeño peppers on hand, I just leave them out of this recipe. Doesn’t have that extra “kick” of spice but still really tasty!